In 1941, George and Angeline “Blondie” Clark founded the farm formerly known as Blonde-Haven. When they moved to their Milton location in 1945, the name evolved into Blonhaven officially. George and Angeline soon thereafter began breeding, hatching and raising pheasants for liberation and hunting. In 1953, Angeline was left a widow with two small children (Jimmy five months and Carolyn four years) and soon opened the first commercial hunting preserve in the state of Wisconsin and one of the first in the country. She operated it by herself for four years. Angeline remarried in 1956 and the farm continued to thrive. In 1978, Jim bought the farm from his parents and from there; the farm took tremendous leaps and expanded. With Jim’s expertise, Blonhaven Game Farm produced over 100,000 pheasants yearly supplying some of the finest hunt clubs in the country with quality flight pheasants as well as high end taxidermy specimens to taxidermists throughout the US. Jim has been recognized as an industry leader and has developed and shared many new innovations with the entire game bird business. In recent years, Jim Clark joined forces with Bill MacFarlane of MacFarlane Pheasants, Inc. the largest pheasant farm in North America. Jim and Bill had known each other in the pheasant farm industry for 32 years prior to this collaboration. Today, they work effectively using both of their expertise combined, to make sure they produce MacFarlane’s highest quality pheasants for not only live gamebird sales, but also gamebirds for taxidermy needs as well. 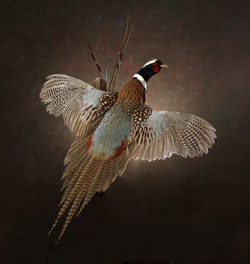 Here at MacFarlane Pheasants, Inc., the grading system holds the same standards you are accustomed to with Blonhaven Game Farm and Jim Clark, former owner of Blonhaven, is actively involved in our taxidermy supply business. Please contact us at 800-345-8348 for availability, ordering or any questions you may have and/or visit our website at www.pheasant.com.